Last week we examined how the Tour de France is actually several races in one and how at any given moment, different riders and teams have different objectives. This week we are going to look at the different types of stages that the Tour throws up and the tactics teams employ to maximise their chances of success. Of the 21 stages at this year’s Tour de France, 19 of them will be road stages. These are mass start stages where every one of the 176 riders push off together in a group, with the winner being the first across the line at the end of the day. 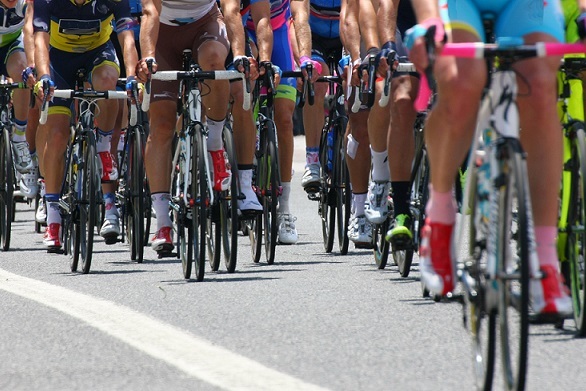 These stages are usually preceded by a ‘neutral zone’ of a few kilometres where the riders roll through the host town behind a lead car, before being given the signal to begin racing in earnest once they are out onto clear roads. Stage three of this year’s Tour will be a 35 kilometre team time trial (TTT). Team time trials can be thrilling affairs. Each team of eight is sent off at a designated time. Their objective is to complete the course in as quick a time as possible. However, the team must work together, slipstreaming each other and rotating turns to ensure that at least five of them finish together (the time is taken on the fifth rider across the line). A strong rider must be careful not to destroy his own team by riding too hard when he is on the front. Riders can, and do get dropped, but it is essential for them to stay together for as long as possible. Having a core group of at least five riders that can finish the stage together is essential. The team must be well drilled and its riders fully switched on. A lapse in concentration by a team member could bring the whole group down, which in turn, could spell the end of that team’s Tour chances. That is something you don’t want to happen just three stages in! Stage 20 is an individual time trial (ITT) over 31 kilometres. As the name suggests, riders take on this course by themselves. They have a designated start time (usually leaving the start ramp at two or three minute intervals) with the winner being the rider who completes the course in the fastest possible time. A rider is not allowed to draft or slipstream behind another rider, so if a faster competitor chases down a slower one, he must pull to the other side of the road and pass him as soon as possible. Being the penultimate stage of the Tour the ITT will be the last opportunity for the general classification riders to make up time on their rivals. As such, it is fiercely contested, often resulting in a last minute shuffle of the leader’s board. So, what can we expect to see from the teams once they are out on the roads? The first few stages of this year’s Tour are flat stages and they will be dominated by the sprinters. The sprinters are the Tour’s fast men, and as they have no chance of winning the general classification, these early stages are their chance to shine. Not only can they pick up a couple of early wins for their teams, they also have the chance of slipping into the leader’s yellow jersey for a few days. To make this happen, teams with genuine sprinters will form a ‘sprint train’ towards the end of the stage. With about 20 kilometres to go all available members of the team will begin to come together within the peloton. They will ride one behind the other (with their sprinter towards the back of their line) and come to the front of the group and begin to force the pace. This has two purposes. Firstly, there is less chance of becoming entangled within a crash if you are at the front of the group and, secondly, the increase in pace makes it harder for anyone else to break away and steal the sprint team’s glory! This is a very frantic and exciting phase of the race. Often several ‘sprint trains’ will be jostling for position at the front of the peloton. Sometimes riders will even hitch a ride behind an opposition team’s train if their own has disintegrated or failed to gel. There is lots of pushing and bumping and it can all become very messy, not to mention dangerous, very quickly. Remember all this is being done at ever increasing speeds, often upward of 50 kilometres an hour. As the kilometre count comes down the ‘sprint train’ will lose its riders one by one. The rider setting the pace will peel off when he is spent and the next rider will take over and so on until only the sprinter and his final ‘lead-out’ man are left. This final lead-out man will bury himself in the last few hundred metres, his sprinter tucked right on his wheel sheltering from the wind. Then the sprinter will launch himself around his lead-out man and kick for the line at speeds in excess of 60 kilometres per hour. If the timing is right and all goes to plan, the sprinter will have time to raise his arms in a victory salute as he crosses the line. If this happens in stage one, then the winner will also be the first leader of the race and get to wear the prestigious yellow jersey. While every team covets the yellow jersey, it brings with it a responsibility. You see, once you have won the yellow jersey, you need to defend it. And that’s why you’ll see the team with the yellow jersey out front of the peloton on most stages, setting the pace and protecting their leader at the same time. It is hard work and uses precious energy. The only time the leading team won’t chase is if it gets one of its own riders in the breakaway. Usually they won’t chase down on of their own riders. If it is a flat stage a team with a genuine sprinter may then take up the chase, not wanting to see a potential stage victory disappear. If it is a mountain stage however, as long as the riders in the breakaway are no threat to the overall lead, then all the general classification contenders – including the yellow jersey wearer – will let the break go, knowing it will have no effect on their positions. The mountain stages can be quite confusing to watch. The general classification riders tend to only mark each other. Stage wins, while gratifying when they come along, are not the priority. Not losing time to your closest rivals is the GC rider’s biggest concern. So while a small breakaway may battle it out for the stage win in the mountains, the real, more important battle is happening behind them, as the GC riders attack and mark each other up the latter parts of the climb. Like I said early, the Tour de France is really several races in one. And yes, it can be confusing. But don’t let that put you off watching. The Tour is a beautiful event. The scenery alone draws thousands of casual viewers each year. The bike racing can also be beautiful. The drama unfolds over a three week period revealing story after story. Stories of riders, stories of race routes, stories of climbs, of weather, of heartache and glory. It’s an addictive story though, so be prepared for some late nights and early mornings.